Cut Your Watering Bill up to 50% with BestYard.com’s Moisture Manager Program! Are you upset at the high costs of watering your yard? Do you want to reduce your watering cost? 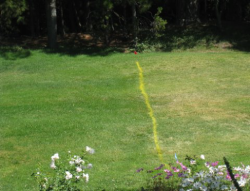 Are you concerned that drought conditions will damage your yard? Do you still want to have a beautiful, lush green healthy lawn? Tiny granules of a new, patented wetting agent attracts water molecules out of the air and surface areas to deliver moisture to your lawn’s root system for 3 months. This treatment is comparable to the cost of a regular fertilizer application, and is dependent on the square footage of your lawn. It lasts up to 3 months, is comparable in cost to a regular fertilizer application. Is It Safe For My Family & Pets? Yes. They can be on the yard immediately after application. Increase water penetration in root zone. Reduce Water Bills 20% to 50% by increasing irrigation efficiency. Maximizes Your Fertilizer & Control absorption in the soil and roots. Reduces runoff on sloped areas so low areas aren’t wet and high areas aren’t dry. HOW MUCH DOES IT COST TO WATER YOUR LAWN? When you water your lawn, you’re paying a fee for water, and a fee for storm water in Aurora and Centennial / North Douglas County Water & Sanitation Districts. BestYard.com has researched the cost that that your municipality charges you for your residential water and storm water fee. The rates are per 1,000 gallons, then per gallon. BestYard.com developed the worksheet below to help you calculate you spend on watering and the potential saving from using new water saving technology Moisture Manager.